Security Breaches are Expensive! Whether your company faces reduced revenues due to illegal software distribution or the release of inside financial information, guarding your data is a vital part of defense. The SmartDongle USB device guards against license theft, software invasion, and illegal file sharing. 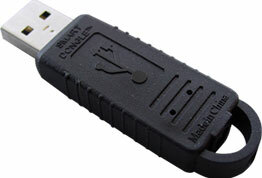 Simply customize the access key with our easy-to-use application programming interface, and the SmartDongle becomes the single point of access for your software. The SmartDongle has superior protection against piracy and unauthorized use of applications or personal data for all companies regardless of size at an affordable price. The SmartDongle provides enhanced security by replacing the Linear Congruential Generator (LCG) with a more secure algorithm. Would be pirates and hackers can no longer write a simple program to watch for the keys as they are passed back and forth from the host to the client. The keys are never passed between the host and client. Therefore, it would take a much more sophisticated program, a whole lot more time, to crack SmartDongle security.